Way back on March 9th, 2012 the Columbus Dispatch printed a preseason preview for the Columbus Crew, entitled; "The Subtle Approach*" by (newly minted beat writer) Adam Jardy. This piece was the largest on the Crew all year for the paper, encompassing most of the front page of the Sports section, part of C6 and all of page C7. In it Jardy asked 5 questions of the upcoming season that could only be answered after the year was over. Here are Adam Jardy's preseason questions (more of points, really) with my thoughts below each one (in italics bold). After parting ways with leading scorer Andres Mendoza, the Crew will look elsewhere to replace his 13 goals. Emilio Renteria might end up being the focal point of the offensive attack, but team officials want to see a wide cast of characters finding the back of the net this season. That means Eddie Gaven, Dilly Duka, Milovan Mirosevic and others need to step up and fill Mendoza’s void for the team to have a chance of a deep playoff run. On aggregate, Gaven was the only hit here (tied with Jairo Arrieta with most on team, 9). As for scoring by committee? The Crew were tied for 6th in the league with 14 different players seeing the back of the net. 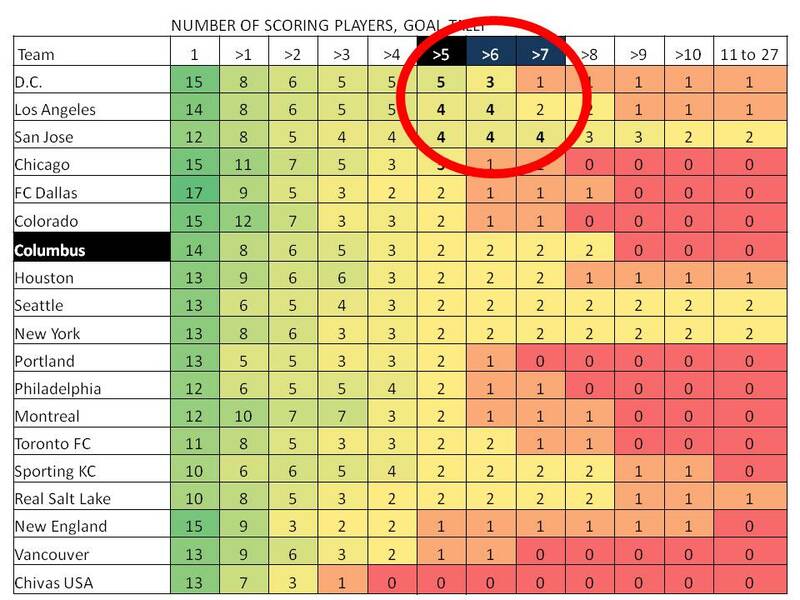 12 teams had at least 13 players score, meaning lots of different scorers isn't an indicator of success. However, having more than THREE players with greater than 5 goals, is (DC, LA, SJ, CHI). More evidence that it's not about having one super star, it takes a village. One thing I want to note here is that Justin Meram's goal scoring rate (0.38) was slightly higher than Federico Higuain's (0.36). Meram's G+A p90 only behind Higuain and Arrieta. Simply put, Renteria needs to avoid the injury bug that has bitten him in previous seasons with the club. The bulky forward is the team’s leading returning scorer, having scored eight goals in 18 games last season, but he will have to improve on that production for the team to have sustained success. If Renteria can play more than 25 games and produce at the same rate he did last season, the Crew will have one of the most-prolific scorers in the league. We'll never really know if Renteria could have been that because his attacking partners in Olman Vargas and Aaron Schoenfeld never got going. The Crew did struggle with injury but Tommy Heinemann's became one of the most significant events of the year. Thinking back now, the Crew reaching for Vargas as a better target man than Heinemann really shaped the season. Vargas was a miss... no Heinemann meant rash signing in an inexperienced Schoenfeld to fill the void. What ended up happening is that the Crew completely changed formation and dangled Renteria up top by himself until Arrieta arrived. The Crew was caught short-handed when Montreal nabbed Josh Gardner in the expansion draft, leaving the club with no experienced options at the position. Speedy Shaun Francis entered the preseason as the favorite to win the job, but the club made it clear it was looking for more options. Veteran Carlos Mendes probably will start at left back but could be better suited for the center of the defense should Francis develop into a starter. The propaganda narrative out of Crew HQ (that everyone latched on to) is that Josh Williams did fine over at LB but is better suited at Center Back. I say that the challenges at LB allowed for the emergence of Williams. It's one of the most significantly positive things to happen to the club in 2012. Williams is a very talented and popular player. Were there not a mess at LB, it may have never happened. I feel that what came out of Crew HQ discounts what Williams did and the impact he made. The front office has been vocal about its campaign to get to 10,000 season tickets sold, stating that doing so is vital to the future financial viability of the franchise. The club remains a ways off from that target, but as important as meeting it is maintaining it once the team gets there. An attractive style of soccer would surely help, which puts added pressure on Columbus not only to win but also to look good in doing so. No official numbers on this but still not at that 10k target. I would estimate the club is still a few thousand away. Attendance overall at Crew Stadium was better but only back to where it was a few years ago. Although the Crew brought in Mirosevic and added young talent during the offseason, the front office fell short in its pursuit of a designated player. Management insists the money remains on the table for a possible signing during the summer transfer window, and bringing in a high-profile name or exciting player would give the team and its fans a major boost. Without the caliber of player such a contract typically provides, the Crew finds itself at a competitive disadvantage. Lots of rumblings about the Crew looking for a DP during the last offseason so when one was finally signed it wasn't too much of a surprise. While most wish it would have happened before the season, all would probably agree that the one the club signed is a good one. That said, even with the signing of Federico Higuian and Jairo Arrieta halfway through the season the Crew may still find themselves at a 'competitive disadvantage'. Before their addition the Crew were 10th in the league... after they came on? Lots of fireworks - but still finished 10th in the league. *Really good work by Adam Jardy this past year. Interesting that I can't find a link to the cover page story "A Subtle Approach" online. People should subscribe the the paper though, anyhow. Maybe they'll be able to send Jardy to more away games. It's only around 15 bones a month. Support newspapers. Otherwise, without power in the press, get use to them kneeling down to local sports teams and becoming an extended PR arm. One quote from the missing article that I like, comes from GM McCullers; "I'm not scared to remind our technical and competition staff that at the end of the day, we do have to sell tickets."